Great bag, Nicole. I love the colors. I've been wanting reusable produce bags for little while. While I was unpacking my groceries yesterday, I looked at the bag my sweet potatoes came in and a light bulb when off. 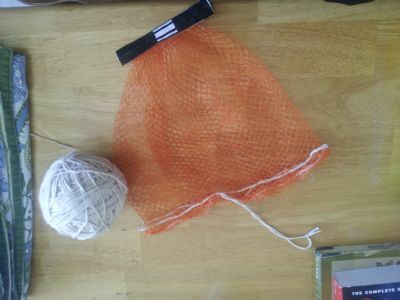 I just hemmed the bag on my sewing machine with a zig zag stitch, then ran a piece of yarn through to be a drawstring. Voila, a reusable bag for my produce so I can use less of the ones at the store. Very clever, Elizabeth. Great idea, very useful and renewable. Brenda LOVE your repurpose idea with the Altoids box. I hope I can get these aprons done and don't leave this sitting in a pile forever. Hard to find time to finish projects but I have good intentions! 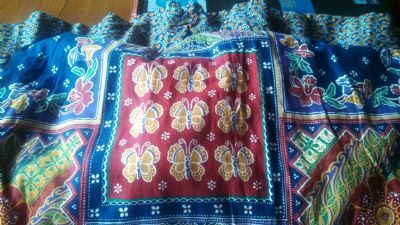 I like the jeweltones and the butterflies and flowers of this vintage fabric. I thought this was so clever. One of my knitting students (she is just the neatest lady) came in to my class with a little "present" for me. Apparently she is very allergic to something and must carry multiple EPI-pens with her. The hard plastic, lift-top case they come in is the perfect size and shape for storing multiple crochet hooks! It fits right in my little accessories case, and makes it easy to grab a hook when I drop a stitch. Oh my gosh thanks Nicole, my hubby has to carry those and I never thought of that! I bought a couple of years ago some half gallon canning jars. Made some refrigerator pickles and pickled onions. I managed to eat up the pickled onions in time but we couldn't down all the pickles. So I did much smaller jars this year and for some reason, they're being eaten up. So.....it occurred to me to use the half gallon jar for ice tea and lemonade. Our pitchers are big, wide and plastic that hold two quarts. This jar is tall, doesn't become really heavy and even the grandkids are able to handle it and pour! My daughter observed all this and wanted one of my jars, too, to use as a pitcher. It sure does take up less space in the fridge. Love it. I'm all about repurposing canning jars. Have tons of them. Some are still used for canning. Great idea, Sylvia! And the lid on the canning jar will keep the inside contents fresh. I just love jars and repurposing them. I will look for a big one now to replace my iced tea pitcher. It takes up a lot room. Anita, how did your apron come out? Did you finish it from the maxi dress yet? My bathroom is dark and only big enough for a shower stall. I use see through plastic shower curtains cut to size from a standard shower curtain. Well I needed a new clothes pin bag. So I took a pretty floral fabric and sewed a shower curtain remenent to the fabric, sewed my clothes hanger inside the top and sewed up the sides to form the bag. The shower curtain provides strength to the fabric and protects it from weather and lets the pretty fabric show through. I hang it from a clothes line separator and roll it around my nonpully clothes line. Lorena, just saw your post. Great idea. My dh has a set of "winter" car mats he doesn't use. They are rubber and he just prefers the carpet ones all year long. I used them in the basement. One by the door next to the garage where leaves and dirt from the outside come in, another one after that as a "trail" to the door to the house, one on the inside of the door in the basement. Traps dirt and mud, easy to clean, non-slip (especially when it is wet and on the concrete and tile). They are thin enough the doors go right over and they don't slip around. Repurposed. I need to replace the plastic shower liner from time to time but it gets repurposed as a cover for our metal firepit on the deck. I fold it in quarters which is the right size and also gives 4 layers. The size and construction of the firepit with the rack and screen cover work perfectly together to keep the inside of the firepit dry from rain & snow and keep it from getting leaves and other junk from blowing in it. Just hung a new liner in the shower and gave the firepit a new cover today! My sister gave me a McCoy mixing bowl she has had for 35 years. She chipped the edge of it a little and decided not to use it for food anymore. I remember seeing Rachel Ray use bowls for scraps when she's cooking. She calls them garbage bowls. Well I decided to use it for sewing scraps. It is real easy to drop in the scraps and threads and empty into the waste basket when full. It looks decorative on the table too. Brenda! What a brilliant idea! I will put a pretty bowl in my sewing room too! Inspiration! Thanks for sharing. I love that idea Brenda :) Too cute! I live in a large city and like to scavenge in and around the dumpsters. I don't jump in there. I just see what is inside and if I can't reach it with a stick, I leave it there. The streets and alleys also have stuff lying around which is useful. Last week I found this zipper pouch that once held a twin sheet set. I love these because the plastic is strong, the zipper keeps it closed and it has a pocket big enough for a card. I have several of these to keep my in progress projects organized. Just wanted to share Bri, my 11 year old daughter's, latest project. She has turned our old cattle trailer into a clubhouse for her and her friends. She is using anything she could possibly find to fix it up. Pallets for a porch, leftover fabric for drapery, an old broken rocking chair bottom for a table, the back of another rocking chair as wall art, old lattice from a torn down home as a roof and arbor, etc. She even rescued some Chamomile plants that were being pulled up from a garden to plant in a pot on her porch. I am so proud of her. Wow! This is really resourceful. I can tell she is a smart young lady.